I have been sewing a little suit for Teemu. 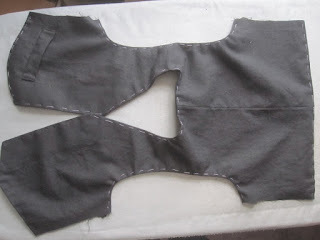 I don't know how everyone else sews and presses but once I turn something right side out, I don't just iron it, I have to baste it first so that I know that the seams are right at the edge. 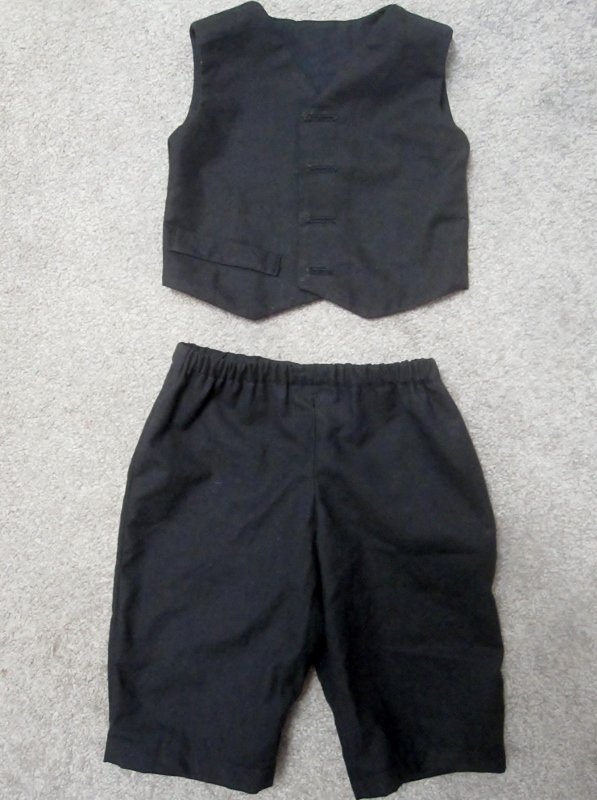 Even with this little 3-month old size vest, I do exactly the same as with an adult garment. The little pants were taken in because they were too wide and they were also cut down from the waist twice because it was thought that they were too big. So, little Teemu has a suit now. The vest, as you can see, has a little welt pocket. I could have put three on it but I thought that would be a bit too much. I haven't put the buttons on since I want him to try it on so I can place them properly. I had to go out and buy black buttons because I didn't have four that matched. I have to work on his shirt now and then he'll be all set to attend his first wedding. All dressed up, and looking so good, small is so much harder to sew, I remember doing dolls' clothes!!! That is exactly how I turn my seams out. My mother taught me that when I was young and still do it for everything. That looks so cute. I've never successfully sewn a garment, so I certainly appreciate how much work this is - what a marvelous creation. Be sure to take a picture of him wearing it!!!! I just pin the edges for ironing. Sometimes I have made a vest with lining that can't be turned the right side out because I didn't follow the instructions carefully. - I thought there must be a good reason for Teemu to need a suit, and a wedding is a lovely reason. A tie or a bow? How talented you are, Dolores. And you seem to do it with so much ease! Won't he be handsome in his suit. I have a feeling he's going to grab alot of attention at the wedding. awwww - a baby sized suit....so cute. He might just upstage the groom!! What an adorable little suit. I do the same thing. I always baste when I turn a lined garment. Such a cute outfit, I was taught to baste everything when I was at school and did it for sometime after but I think because I sewed with lots of stretch fabric that went by the way.